Come on, admit it, you’ve always wanted to paint in watercolor. 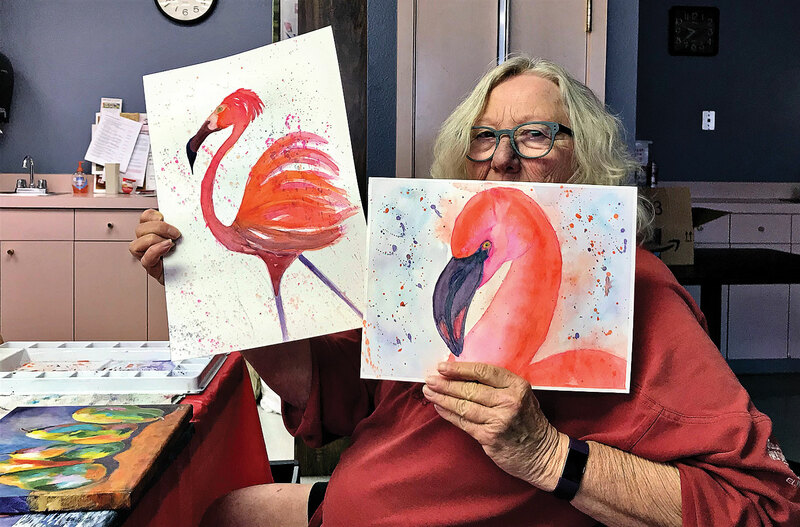 There are so many articles written about the therapeutic effects of watercolor, and some have compared it to meditation in its ability to relax painters when they get in the “zone.” You’ll love it; you really will. There is nothing more exhilarating than opening up your palette and seeing all those lovely, vibrant colors sitting there waiting for you. You’ll meet interesting, creative people who will have fun with you as you learn together. You’ll have a teacher who will do her best to be supportive and encouraging during this journey, so why are you waiting? It’s cheap, easy and fun. We all start out as little kids loving to color, draw and paint. Somewhere along the way, someone makes a critical remark that ruins it for us. We put down our crayons and say we can’t do it. That makes me so sad, so I’m making it my goal to revive that joy with as many people as possible. You do not have to be able to draw. I’ll show you how to get around that stumbling block – don’t worry. They say at our age we need to keep our minds fresh by learning new things, so why not try watercolor? It’s time to stop putting it off and come join us. No, you artists aren’t born with an ability. Successful artists are people who carefully look at what they want to paint and then practice. Once you learn basic techniques, it is a simple matter of putting paint on paper. I was overjoyed when, without being told it might happen, I heard two of the beginning students talk about the wonderful feeling they were having painting. It was so relaxing. When you are painting, you actually relax to a point that you have the best feeling and are totally enjoying yourself. I know, I know, it sounds like I’m getting a little hippie dippie. I do live in Oregon where that’s totally normal, but I grew up in Missouri where we scoff at such nonsense. It happens, it’s wonderful and it’s one of the reasons I got into painting. It’s actually the switch from the left, logical side of your brain to the right, creative side of your brain. My job was all left side with logic and math. It was so stressful, and when I painted, I went to the right side, and it was such a relief that I was hooked. At our age, we need to do anything we can to help our brain. So come see what this is all about. Call me at 503-649-9097. I charge $5 per class. You’d pay more at a visit to Starbucks! Don’t buy anything before the class. I’ll lend you supplies for the first class and then direct you to purchase supplies that will make you successful. You can’t do watercolor without using the correct materials, but that doesn’t mean it has to be expensive. Really, what are you waiting for? Dianne Wimmer is a good artist but super shy when I take her picture.